When a former Chinese Communist leader does not take part in the formulaic arrangements for the funeral of a high-ranking Party official, people notice. On Jan. 15 the former party secretary of northwestern China’s Shaanxi Province, Bai Jinian, passed away at the age of 89. Following the announcement, state news media reported a list of high-level authorities and former high-level leaders who had sent their condolences on Jan. 19, the day of the funeral. Yet the names of former Chinese Communist Party (CCP) general secretary Jiang Zemin and his close ally, former vice chairman Zeng Qinghong were absent from the list. Officials’ public appearances are often seen as a weathervane of the current political situation. The list included over 40 current party leaders and retired leaders, such as CCP general secretary Xi Jinping, prime minister Li Keqiang, former CCP general secretary Hu Jintao, and former prime minister Wen Jiabao, etc. Xi’s mother, Qi Xin also sent a bouquet of flowers with her condolences, Shaanxi media Huashang News reported. The public appearance of communist officials and the sequence of their names have consistently been reported with the permission of high-level authorities in China. The public appearance of an official usually sends out a message to the public that the official is safe and still in power. 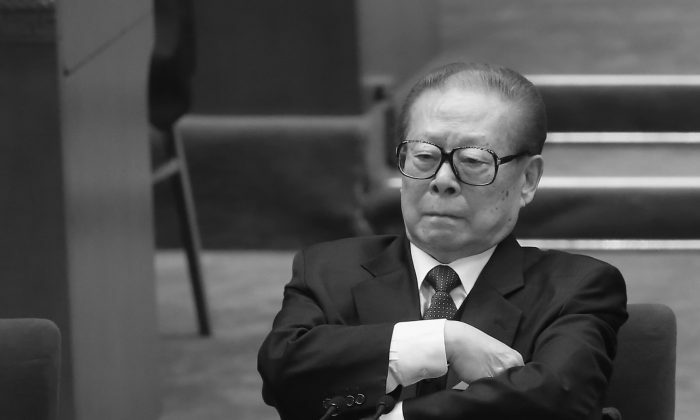 Jiang and Zeng’s absence from the funeral has raised speculation that Jiang’s faction is losing power. Officials’ public appearances are often seen as a weathervane of the current political situation. When former secretary of Politics and Law Committee in Guangdong Province, Liang Guoju, passed away in June 2014, all current high-level leaders and former leaders “showed up” in the mourning list, except for Jiang Zemin, Zeng Qinghong, and also former secretary of the state Politics and Law Committee, Zhou Yongkang. Later on in July, Zhou was put under state investigation for corruption. In early January Jiang Zemin along with his children and grandchildren traveled to Dongshan Ridge in southern China’s Hainan Province to celebrate the New Year. “Dongshan” means “East Mountain” and Chinese associate “east” with rising power. Therefore, appearances of climbing Dongshan Ridge are usually loaded with political meaning. Some Chinese news websites reported about Jiang’s jaunt to Dongshan on Jan. 3. Later that same day news about his trip was deleted from all Chinese websites, indicating that Jiang’s public appearance might have been blocked under order of the central authorities. After that news was blocked, on Jan. 8 state-run media announced Jiang’s son, Jiang Mianheng had resigned from his position as president of the Chinese Academy of Sciences’ Shanghai Branch due to his age, although he had not reached the customary retirement age of 65. Some analysts interpret Jiang Mianheng’s stepping down as punishment to Jiang for his public appearance at Dongshan Ridge. A China political commentator in Washington D.C., Xia Xiaoqiang said that Xi’s speeches and actions towards Jiang, Jiang’s son, and Jiang’s allies send out a signal that the anti-graft campaign is narrowing in on Jiang’s family.